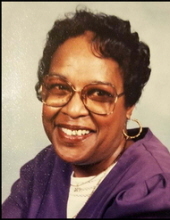 WARRENVILLE - Mrs. Sarah Leona Odoms Robinson, age 75, of 371 Breeze Hill Road, went home to be with the Lord Saturday, September 29, 2018 from a lengthy illness. She was married to Freddie "Chic" Milton Robinson Sr. for 35 years until he preceded her in death. Mrs. Robinson was one of five children. Eugene Odoms, Ella Oliver, and Hilmon Odoms Jr., preceded her in death. Survivors include; Her sons and their wives include Freddie (Kay) Robinson Jr., Gene (Kimberly) Robinson, and Phillip (Vanessa) Robinson. Her sister, Connie Lee-Smith. One God-daughter, Jennifer Washington. She had eight grandchildren, three great-grandchildren, and a host of in-laws and other relatives. Funeral services will be held 11 AM Saturday October 6, 2018 at St. John Baptist Church, 286 Huber Clay Rd, (Viewing 10-11 AM), with Rev. Curtis Blocker, Pastor. Burial will follow in the Church Cemetery. The family will receive friends at St John Baptist Church on Friday from 6-8 PM. Friends may call the residence or JACKSON-BROOKS FUNERAL HOME, 126 Fairfield Street SE., Aiken, SC 29801 @ 649-6123. To send flowers or a remembrance gift to the family of Sarah Leona Owens-Robinson, please visit our Tribute Store. "Email Address" would like to share the life celebration of Sarah Leona Owens-Robinson. Click on the "link" to go to share a favorite memory or leave a condolence message for the family.